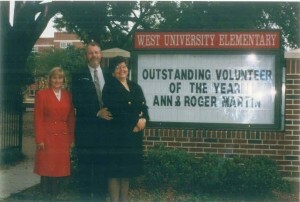 Roger and Ann Martin have been a part of West University Elementary School for the past six years. But they're not students, they are volunteers who have spent countless hours working to improve the quality of education at the school. The Martins were recently selected as the Houston Chapter of the Texas Society of CPA's volunteer 'Award of Excellence' recipient. They will receive a $500 cash price and a plaque recognizing their outstanding achievements at an awards banquet on May 22, and will be eligible for an award at the state level. The CPA Society, which is committed to improving the quality and scope of public education, recognizes volunteers who are working to achieve through education and improve the community in which they live. The Martins, who were nominated for the award by West University Elementary Principal Dr. JoAnna Ide, have donated both time and money to the school over the past several years. 'We came here a kindergarten parents with our son Christopher, and we've been around ever since,' Ann said. The couple became actively involved with the school when Christopoher was in the first grade, and their involvement has grown ever since. Roger began working with the Parent Teacher Association, and on the school grounds and buildings. Roger was also involved in setting up the school's Shared Decision Making Committee (SDMC), which acts as an advisory and oversight committee on campus. He helped write the [bylaws] for the committee, which is made up equally of teachers, parents, administrators, and community business people. He was also involved in the effort to provide exceptional technological opportunities for the students. 'When we started here, the school had 14 older computers,' Ann said, 'and because the school was built during the Depression, there was nowhere near enough wiring to support any number of computers. The Martins were instrumental in helping West University Elementary secure a $107,000 grant for the Texas Education Agency to prvide a school computer network. Today, the school has a computer lab with 32 high-end Macintosh computers, and each classroom is equipped with at least two computers and one printer. The computers are networked throughout the school, and the school can connect to Tenet (the Texas educational computer network) and the Internet. Roger has also donated five percent of his real estate gross commision to provide computers for the lab. Ann, a geologist by training, started her volunteering career as a homeroom mother in the PTA, and began working with the school's science teachers on an enrichment program to complement the school's science and math programs. She has served in many areas of the PTA, including a term as PTA treasurer. As this year's fundraising vice-president, she helped the PTA organize a large multicomponent fundraising event, which included a book fair, a school carnival, and an auction. Ann was instrumental in providing the school with an Urban Wildlife Center that has been recognized by the National Wildlife Federation and the Texas Parks and Wildlife Department. The science teachers had always wanted an area where the students could work on biology experiments, or plant a garden, or simply observe animals and insects, Ann said. In addition to helping create the wildlife sanctuary, Ann also helped the math department secure several guest speakers, mostly minorities, to serve as role models for the students. 'The speaker program was important because it's so necessary for these kids to see what's in the real world, and what they can become if they apply themselves and work toward their goals,' she said. Christopher is graduating this year, but the Martin's involvement at West University Elementary will continue. Ann has been asked by Dr. Ide to serve on the SDMC as a community representative so she can continue her work at West University Elementary. 'When we came here, this school had a wonder reputation, and it's just gotten better and better over time,' Ann said. "It's great to see a good school grow into a wonderful school, and we're really proud to have been a part of it all."